Slicing cheese requires power, and running a busy shop requires production. This slicer delivers both in a powerfully accurate professional quality machine. Chicago Food Machinery’s factory has the experience of two decades of production in creating its professional grade slicers. Our reputation for quality and service is what sets us apart and our commitment to continuing attentive customer service after the sale and making sure that this slicer offers decades of life equipment is our pride and our promise. This quality heavy duty slicer sells for less (compared to other brands coming off the same assembly line that sell for twice as much) without the fancy brand names and expensive distribution models. This slicer is our flagship manual slicer, setting the standard for power, reliability, and accuracy. Our slicer frames are constructed of high quality oxidized aluminum magnesium alloy machined and finished to professional standards for lasting beauty. This engineered beauty is paired with plenty of performance power for total ownership satisfaction. 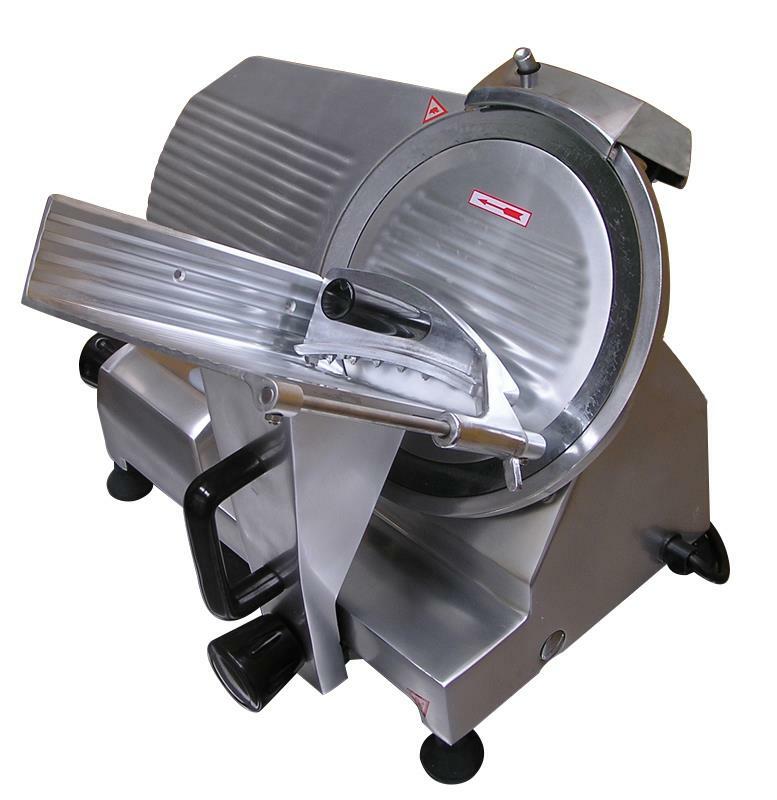 Featuring a Chicago Food Machinery’s all stainless steel blade, with waterproof emergency shut off switch, this meat slicer will cut into any slicing job. The blade is adjustable for precision slicing accuracy, and the carriage is set at an angle for no snag feeding of the meat to the blade. Chicago Food Machinery’s slicers are everything that anyone would expect from a top quality heavy duty slicer, but with a direct from factory distribution path for higher value.